Take a good look at your Inbound options. If you are considering integrated Inbound marketing you're likely already well aware of the benefits for B2B, and the power of HubSpot to bring it all together with automation and reporting. You are not alone. Many of our clients have dealt with classic marketing challenges that can be resolved with HubSpot and Inbound. It's all about moving away from siloed tactics and towards integrated strategy with metrics. The idea is to have a clear view of the intent of every moving piece, see how it connects to a wider strategy and ultimately, to define results. Companies need to be able to see, in clear terms, which way the needle is moving (or if it's actually moving at all). If you want to bring this capability and value to your organization, you are looking at two clear alternate paths to do it. Option 1: Stay internal & keep it in house. This could be a viable option depending on the skillset, specialty, and bandwidth of your team. For this to work, your in-house team needs to have intellectual curiosity and a passion to evolve and drive value. That might sound obvious — after all, who does not want or expect that from their team? But you need to take a hard look at actual ground conditions. Are they more literal, task-oriented doers, or are they capable of jumping into new methodologies and figuring out how to make an impact? Do they have multiple skillsets? Are they efficient and productive under pressure? Most importantly — do they have the right attitude? Are they positive, proactive, committed? Do they thrive on being challenged? If you are not confident that you have a deep enough bench, and you have budget, then you can look at hiring. If you are fortunate, you will find the right people at the right time to help you do this properly. Of course, there are some experienced Inbound marketers out there. However, some traditional marketers don't really know Inbound beyond speaking to it generally as a tactic. Of the ones who have meaningful experience in it, you need them to also have deep HubSpot chops so that they can hit the ground running for you. After all, you need your people to be spending time on what matters, not spinning wheels. Whoever you have on your team will need to go beyond having a strategic understanding of your plan (that's non-negotiable) — they need to be ideating, challenging assumptions, and pushing in new directions for you. That's the only way they're going to deliver a pressure lift for you, and deliver meaningful results for your business. Tip: You can ask your current people to get HubSpot Certifications. This training is free, and will help your team learn some of the thinking behind Inbound and HubSpot. The right people will want to do these. 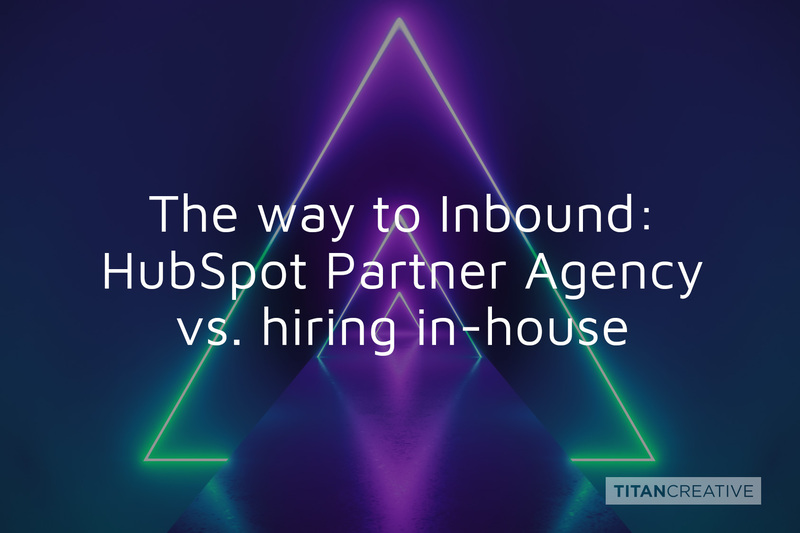 Option 2: Go external with a HubSpot Agency Partner. You can plug into a well-oiled machine that has deep capabilities in all the critical elements of an Inbound plan. The agency will bring multiple talents, skillsets and specialties to the table. A good agency will have an entrepreneurial purpose-driven mindset at all levels. They will have developed efficiencies through their agency experience. They will have learned through working with other clients what works, what does not, and how to push forward to keep things moving. When you think about the moving parts of a successful well-oiled Inbound marketing machine, the specialities required are truly varied. Think about what it would take to do them all well internally. Strategy. You need someone who can dial into larger strategy in a meaningful way. This does not mean saying things that sound strategic in meetings. This means really leaning in as a true partner to advance the goals of your business, and be able to link back all executions to that wider strategy. You need someone running this for you who 'gets it' and will push it forward. Content. Everyone knows that content is important. Some think that almost anything is (or can be) content. To do strategic Inbound content, you need deep familiarity with the Inbound methodology, competitive research, and genuine understanding of strategic positioning. And frankly, the quality of the writing and editing needs to be higher. It's not going to be helpful to crank out keyword-laden generic content. True inbound necessitates a higher bar. Project Management. You need someone diligent who will own task status and reporting, to make sure that no balls are being dropped, and to keep internal and external teams focused. Without that, you're swimming around in the dark — and in different directions. Platform. You need someone who can manage your marketing technology platform. Someone who can confidently work inside HubSpot to ensure that your efforts are optimized and set up to deliver maximum benefit. If the technology part is not solid, you can encounter needless roadblocks. When it is solid, you can make things happen quickly. Social media. To leverage social well, you need someone at the table who has deep understanding of the various social platforms, and they need to be able to think in terms of Inbound campaigns and personas. Your social lead needs to proactively create, schedule, post and monitor, while also being an important stakeholder in strategy. Design. Creative and brand is always an important part of marketing — and consistency is critical. You need to make sure every design execution ties in well to your Inbound strategy. (We all know what it looks like when you see sloppy expressions of brand in market.) You need to push things up a notch, and bring an Enterprise standard to the table, regardless of the size of your business. Website dev and coding. You need to make sure that updates to website pages can be made proactively and not get lost on the lists of developers who are juggling requests for too many people and divisions. Online advertising. You need to run campaigns that will make the most of your budget and ensure that there is optimization and alignment with the wider Inbound strategy. Looking at the above list, ask yourself how your internal team would fill these needs. Keep in mind, no one, two or three people are going to have the focus or expertise required in all of these areas. That makes the in-house option a steeper hill to climb. In addition, a good agency will have developed processes that optimize all of these required moving parts. Over the years, we have worked with many SVPs, marketing directors, and marketing managers — and we understand how hard it can be to move things forward. You need accountability, focus, experience and energy — across the board. When you are investing in an Inbound strategy, and those chips are on the table, a bluff will not help you win the game. You need to know that you are indeed holding a great hand. So, take the pressure off and make a smarter bet. Up next | Read our B2B Inbound marketing overview. PREVIOUS8 misconceptions about marketing automation for B2B.